On Saturday, December 1st, 2018, my brother and I came to Hatboro-Horsham high school, where Hat Tricks was being held, with donuts (to prevent any fatigue happening during Hat Tricks). I spent most of the morning waiting for the others to arrive and practicing with the presentation team. I later went to the pit to check on our robot, and then it was time for presentations. The rest of the presentation team and I were a bit nervous about presenting, but we managed to get through it. Once we finished, we went back to the pit to give our robot back to our teammates. Our team continued to fix problems on the robot until the competition began. 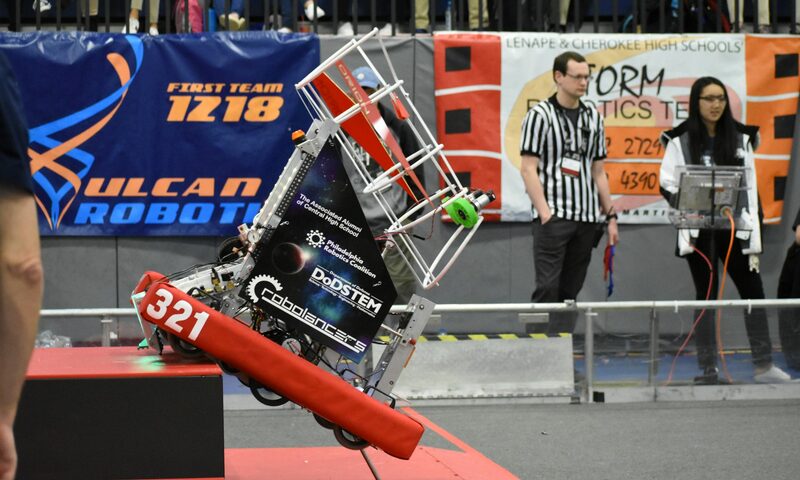 Our matches against the other teams/alliances didn’t go so well due to the robot suddenly losing its wheels, getting stuck, and not turning on. But, we managed to be one of the semi-finalists. We didn’t get to the finals, but we gained new ideas on how to improve our robot. When the competition was finished, we packed our things and waited (totally not dancing while waiting) for the awards ceremony to start. During the awards ceremony, we didn’t gain any awards, which saddens me a little bit for our team. Ramp Riot was great and overall much more fun than I expected, and I do not regret going at all. The energy of the matches was great, and we all cheered for our robot no matter what happened, good or bad. We even got to finals, with the hooting, hollering, and screaming clapping madness, and there was an atmosphere unlike any other sports game I’ve ever been to. Ramp Riot was everything I could have wished for in my first FRC event! On November 3, 2018, Robolancers team gold participated in the robotics Ramp Riot competition. Team Gold had a wonderful time, we befriended other teams as they were incredibly kind and courteous towards us, never showing contempt or scorn. In the meantime while we were actually competing I had acquired the luxury of scouting and was excited to meet other teams. The other teams were fantastic, their robots were incredibly impressive, some even had a working latching system, which was essential for maximum point-gain during the matches. In general we had a rather wonderful time, and when we weren’t participating in matches, we were working! In the many hours we were there, we worked hard to develop our latching system and intake system, and in time we successfully developed our first working latch prototype! However we couldn’t attach it at the competition. The experience of going to our first robotics event was incredibly satisfactory, even if we didn’t do that well in the competition as we procured eighth out of tenth place. Duel on the Delaware was the first FRC off-season event I went to as a new robotics member. My main job of that day was to take videos and pictures of our robot alongside my friend Julie. During the practice matches, I got familiar with working the camera and started exploring the pit and meeting new teams. Our robot didn’t play until a few matches in, but watching the other teams play was a fascinating start. Once our team started, I took pictures of our drive team and immediately started moving around in the pit attempting to get some good footage. I also got to sit in watching a mock Chairman’s presentation, which was interesting because of how the presenters were able to memorize all of the team’s information. Unfortunately, our robot wasn’t functioning well at first due to technical problems, but after lunch, our robot was all fixed up and ready to play. We didn’t win, but we got to experience working with different teams. Overall, the competition was an interesting event. I learned how to properly use a camera, hung out with my members, and expanded my interest in robotics. Ramp Riot was a blast. The people, the jokes, and the game are sure to give me a lot of good memories. I was nervous Crimson’s first match because I was driver, during the match one of our wires wasn’t working right and our robot didn’t work. It was even more nerve-racking after that because of the anticipation that our robot wasn’t going to work but after a while everyone was relaxed. Overall our matches went really well until we forgot to turn on our robot which was really embarrassing. I’ll make sure to never forget my first robotics scrimmage. Duel on the Delaware was held at Salem Community College on October 20 featuring almost 30 teams. The RoboLancers ranked 20th before they were picked by alliance number 4. 1640, Sa-BOT-age was the captain and 4342, Demon Robotics was the first pick. Throughout the qualification matches, our robot had many difficulties, however, our programmer, Jenny Wen, was able to make a working code for our robot. Additionally, our Talons shut-down and Cindy Chiu and Sylvia Cho managed to fix the robot in time for our next qualification match, we lost our quarterfinals 1-2. We lost a tiebreaker series by only 40 points to the 5th alliance who went on to defeat TechFire and become a finalist at the event. Our team really pulled through all the hardships thrown at us. They were very efficient with the interchanging drivers and manipulators. The Safety Bootcamp class teaches you how to handle tools while operating in the workshop. The class begins with the usual debriefing, informing us as to who has permission to use a certain tool and who does not. We were then warned about the dangers of not correctly using the tools. Then, the actual hands-on work happens. We learn about some of the important and different tools and supplies we may need to build the robot, such as the band-saw that cuts the metal, polycarbonate and the drills which we utilize to bore into the bones of the robot. Learning about the tools and the different supplies may be very appealing to those who are interested in hands-on activities. On the other hand, if you love creating things with your hands or want to bring your ideas to life, then electrical or mechanical is the subgroup for you. These subgroups bring their ideas to life, in the physical form. Maybe it’s the hands-on experience, or the opportunity to bring your ideas to life, or even just the group of creative people who you join. No matter what reason it is, it can’t be done without the safety class. This class allows you to bring your idea to life with the minimal amount of risk of harming yourself. Without the Safety Class, many of the most creative people, specializing in bringing their ideas into the physical form, may be harmed and may possibly be discouraged into following their passion. Have you ever felt so passionately about something you want to do? Do you want to participate in that ¨something¨ so bad but you can´t? That’s exactly why we decided to join business! We felt more comfortable and interested in business, since we already knew we wanted to join it the first place. We mainly talked about what the team does; learning that business focuses on communication and finances for the team, which is extremely crucial. As expected, we both joined business after bootcamp. Although we are not familiar with each other yet, the upperclassmen seem nice. We are already sure that it was not a mistake to join business. Why should you join business? Well, we just told you, didn’t we? But there are obviously more reasons as to why you should join business. If you are interested, you should find out for yourself! The First Tech Challenge (FTC) boot camp was an interesting experience, featuring moments both entertaining and informational. We had two teachers, both experienced members of the team in their own right. They were funny, often engaging in joking arguments with each other or the students. They were able to make a potentially boring subject interesting, which made it a very enjoyable experience that promised a lot for the robotics season. We went over the FIRST acronym, learning its meaning “For the Inspiration and Recognition of Science and Technology”. Next, we learned what the team expected of us, and how to uphold those expectations. Then, we discussed this year’s FTC game, Rover Ruckus. We went over the rules, awards, and some strategies to think over. Lastly, we discussed the Engineering Notebook, an integral part of any FTC robotics team. Overall, the FTC boot camp session was a promising experience that set an inspirational tone for the rest of the FTC season.